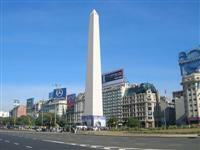 Buenos Aires (meaning 'fair winds' in Spanish) has several enthralling attractions. Most sightseeing is best done by day, for aesthetic and precautionary purposes, and walking is the best (but by no means only) mode of transport in this intriguing city. 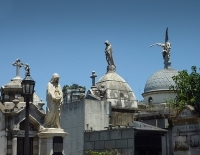 Visit the Cementerio de la Recoleta, home to the tomb of Eva Perón, the actress married to Argentina's President Juan Perón and subject of the musical Evita, or wander under the magnificent facades of the downtown area, favourable for its marvellous old European buildings. Enthusiastic sightseers can take a paddleboat from the promenade in Palermo and stroll through the beautiful flower garden. An absolute must for culture vultures is a trip to the Palermo Viejo district, with its charming cobblestone streets, bookstores, bars and boutiques, or an afternoon exploring the Caminito pedestrian street's arts and crafts in La Boca. 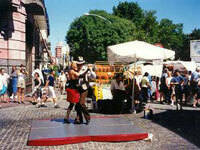 Enjoy watching tango dancers in the cobblestone streets and take a tour of the La Bombonera Stadium. 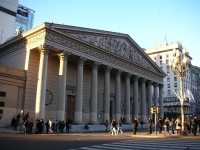 Experience El Puerto de Buenos Aires during the day or, for a taste of history, visit the National Immigration Museum. 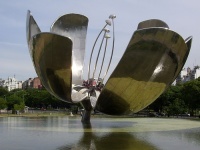 Visitors wanting to catch a show can do so at the Recoleta Cultural Center. Built in 1732, it was originally a convent connected to the Basílica del Pilar. Today it is a cultural centre hosting concerts, live performances and screenings. 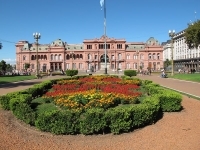 The historical building also houses sculptures, paintings and photographs in different exhibitions, providing a fantastic sightseeing experience for any visitor to this exciting city. 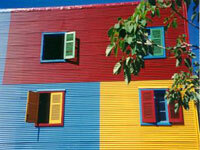 We are looking for contributors for our Buenos Aires travel guide. If you are a local, a regular traveller to Buenos Aires or a travel professional with time to contribute and answer occasional forum questions, please contact us.